This article first appeared in Moscow’s Passport magazine. 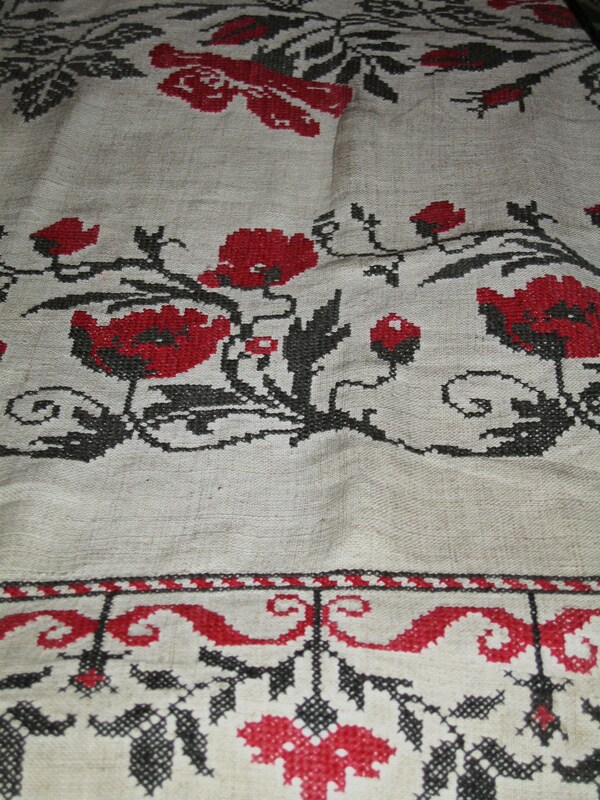 As the summer solstice approaches, Belarusians will have a twinkle in their eye and a spring in their step. Of course, we all look forward to the warmer months; they’re a time for stripping off our winter woollies, eating ice-cream and fresh strawberries and, naturally, pursuing love. To mark the rising of the sap and the return of the sun’s warmth, Belarusians have been celebrating Kupalle for well over a thousand years. Originally a pagan celebration of fertility, such is the magic of Kupalle night that trees are said to find their voices. They even lift up their roots and stretch out for a walk. Once the sun has set, witches and supernatural creatures supposedly creep about the forests with ill intent. Anyone who is wise in the ways of Kupalle stays well away. However, it is also a night of excitement, flirtation and ancient ritual. One of the most well-known of its legends is that of the flowering fern: it is – said to bloom with a single glowing scarlet flower only on this night of the year. Anyone lucky enough to find it gains understanding of the language of plants and animals until the sun rises once more. More enticingly, pointing the bloom towards the earth renders the soil invisible – enabling any buried treasure to be discovered. However, the fern’s flowers are guarded by demons, so only those with a pure heart can succeed. 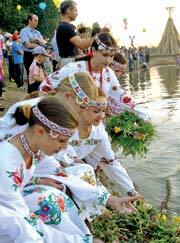 In earlier days, young girls began Kupalle by going to the banya in the morning – to purify themselves. They would then go into the meadows to collect cornflowers, thought to have particular healing and protective powers at this time, and weave them into garlands for their hair. These garlands could also be used for fortune-telling by throwing them into a stream. If a garland rotated on the spot, its owner would remain single for another year. If it sank, she’d marry the following year. You could learn the direction your husband would appear from by seeing where the garland hit the bank. Cunningly, any lad who was sweet on a particular girl could chase her flowers downstream to ensure he’d be there as it touched the edge. Young people still drive out to the countryside to indulge in this flirtatious pastime. Ever keen to find out about their marriages, young girls would also pick plantain leaves (those growing at a crossroads were thought to have particularly strong powers) and place them under their pillows on this night – to ensure dreams of their future spouses. To make extra sure, a bowl of water could be put at the head of the bed, with a makeshift bridge across it. Husbands-to-be would appear in dreams, crossing the bridge. While the girls indulged in these whims, the menfolk would find a site, preferably near water, to light a fire (symbolizing life and purification). This was thought to encourage crops to grow and any unwanted items were thrown on the fire destroying all that was old and useless so that all that was new could be embraced. At sunset, the girls would arrive singing, and a cartwheel coated with flammable tar mounted on a high pole would be burnt – representing the Sun – as everyone danced in a symbolic circle. The girls would throw their garlands over the fire: whichever young man caught the flowers on the other side might become her sweetheart. Ritual food was also cooked over the flames: fried eggs (recalling the sun and life), kulaha (a pudding made of wheat powder) and vareniki (dumplings stuffed with berries) were especially popular. Jumping over the fire was supposed to be a strong talisman. The flames were believed so powerful that people would place the shirts of sick people nearby to dry and small children were brought close – to deter any evil spirits who might be jealous of their youth. 21st century Belarusians still take a trip into the forest on this night, have a picnic and amuse each other by jumping over a camp fire. To ensure maximum benefit, this should be done naked – and sweethearts can jump holding hands to protect their love for one another. It’s said that, if sparks fly up, the couple will marry. If the couple’s hands separate in the jump, they’ll split up. To protect against all the mischievous demons roaming the countryside, people made sure that their horses and cattle were kept in the stables, with a bunch of nettles hung over the door. Burning coals were taken from the Kupalle fire and brought into the home. Meanwhile, women wore their blouses embroidered with red thread – since this colour (reminiscent of fire) was thought to protect the wearer. Water was also said to have amazing properties on Kupalle night, so, bathing in a river was a must. Illuminated by mystic forces from midnight until dawn, water was said to glow with supernatural powers. Some Belarusian babushkas still swear by the magic power of a roll in the dew on this date to keep them young at heart, and sprightly in body. Many practical jokes accompany this festival. Even today it’s a perfect opportunity for high-jinks. Young people staying with their grandparents in the countryside like to indulge in the tradition of hiding things. Stealing someone’s gate and concealing it in the forest or tying up the front door so that it can’t be opened are particular favorites. Needless to say, few courting couples need much encouragement for a solitary walk in the woods with the pretense of looking for a magical blooming fern. Despite centuries of Christian teaching, which strived to dispel the influence of pagan festivals like Kupalle, the significance of this special night continues to linger. Eventually, the church was obliged to adopt the date as St. John’s day to give it some semblance of propriety. 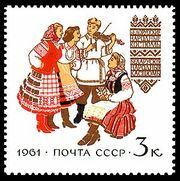 Such is the enduring popularity of this festival that it remains close to the hearts of our modern day Belarusians. Few would deny that they have, on occasion, indulged in searching for the fern’s flower, jumped over a Kupalle fire, tossed a garland downstream or tucked a plantain leaf under their pillow on this most auspicious of dates.